The presence of a ‘ Garden of Remembrance ‘ in the village, at the junction of Sleaford Road and Rectory Road, barely 200 m. from the village War Memorial in the Cemetery, seems rather strange, considering the size of Ruskington. However, it is at this location that the village’s annual Remembrance Day service takes place on the Sunday closest to 11 November. The Garden dates from post World War 2 and, as there was no available space on the ‘Cemetery Memorial’ to commemorate the 11 local men who gave their lives in World War 2. The Garden also incorporates the names of village casualties from both conflicts. The site is also more accessible to villagers on Remembrance Sunday than is the Cemetery cross. The Garden is a walled area, accessed by wrought iron gates, bearing a Memorial Plaque. The postcard above dates from the 1950s, not long after the Garden was opened. At the time of the Great War the site appears to have been open land, but shortly after the War Mr W.H. Brown donated a surplus Army hut to the village, to be used as a community centre. The hut was sponsored by the YMCA and the “Red Triangle Club” was formed. “The Hut” comprised an entrance hall housing a full-size billiards table, a main room for dances and social events, kitchen and cloakrooms. In around 1926 it was moved to Chapel Lane and much enlarged. It now had separate billiards rooms with two tables, a shop selling refreshments, run by the caretaker, a committee room, for smaller functions adjoining kitchen and a large main hall equipped with a stage at the far end flanked by two dressing rooms. 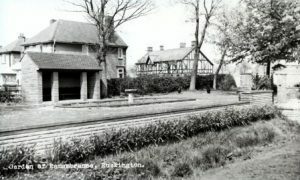 The building which was the hub of the village social life in the 1920s and 1930s was demolished after the 1939/45 War. The entrance gates bear a metal plaque listing the names of the 30 Great War casualties and the 11 Second War casualties. At the rear of the Garden is a brick built arbour containing a display platform where wreaths can be laid under cover. This also contains a – difficult to photograph – Memorial Plaque, with gold lettering on a black background, mounted behind glass. However, this plaque, if it existed, is no longer in evidence. Nevertheless, commemoration pages are present in this site for these men (plus others as they are found) and can be accessed via the “World War 1 – Casualties” link above. In addition to the War Memorial Gardens, Ruskington has four other Memorial sites and each has its own page in this site. The Methodist Church Memorial, Chapel Street, Ruskington .